A musical evening by Arnab Bhattacharya and Nilimesh Chakraborty from India will be held at Kabi Sufia Kamal Auditorium of Bangladesh National Museum today at 6:30pm. 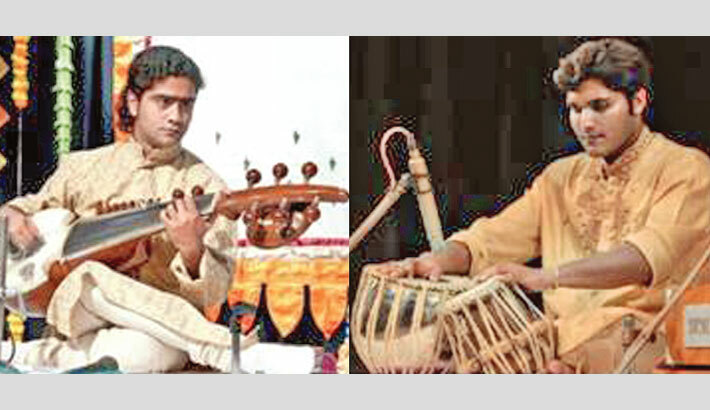 Arnab Bhattacharya will perform on Sarod with Nilimesh Chakraborty on Tabla. Indira Gandhi Cultural Centre is organising the musical evening as their regular cultural programme. Arnab Bhattacharya started learning Sarod at an early age from his father Swapan Bhattacharya and later from Pandit Buddhadev Dasgupta of the Senia Shahjahanpur Gharana. He achieved ‘Sangeet Prabhakar’ degree from Allahabad University in 1999. His music is a blend of traditional and modern form of Indian Classical music. He was awarded in many talent search contests in India viz ‘Arabindo Music Festival’, ‘Ankit Talent Search Contests’, ‘All India Music Competition’ etc. He also received several awards like “Sarod Sunder” from Orissa in 2005, “Sarod Naya” award in 2007,”Nabin Sarod” in 2009. Bhattacharya is a regular artiste of All India radio and Doordarshan in India. He had successfully participated in several prestigious stages in India and abroad including Salt Lake Cultural Association, Bhowanipur Sangeet Sammilanee Kolkata, Ramakrishna Mission in Bangalore and Bhubaneswar, Rajya Sangeet Academy, Raja Rani Festival, All India Music Festival, Lucknow Music Festival, Goa Music Festival, World Music Festival, Geneva Drums and Music Festival, Music Coire, Texas etc. In 2009, he was invited by the University of Geneva, Switzerland, for lecture demonstration in Indian Classical Music and for participating in seminars and workshops on World music. He has also given background music to many documentary films. On the other hand, Nilimesh Chakraborty was born in a musical family and started learning Tabla from his uncle Sri Ajay Chakraborty and later from Shri Debasish Mazumdar. He was also trained under the tutelage of Swapan Siva of Farrukabad Gharana. He has received several awards like 1st position in Doverlane Music competition, Sarba-Bharatiya Sangeet Parishad and Murari Smriti sangeet samellan, 2nd position in the West Bengal State academy competition, TTIS fest award etc. He has performed in different festivals in many cities in India. He had accompanied the legends like Late Kamal Mallick, Padmashree ustad Rashid Khan, Joydeep Ghosh, Parthosarothy, Ustad Amaan Ali Khan, Sugato Nag, Tejendra Narayan Majumdar etc. He is an empanelled artiste for the Government of India like SPICMACAY (The Society for the promotion of Indian Classical music and culture amongst youth) and ICCR (Indian Council for Cultural Relations). All are cordially invited to attend the programme. Entries open to all and there is no need to collect invitation pass.